Images: We are at Pettifers Garden with Gina and James Price this weekend, my lovelies. Cannot think of a better way to celebrate spring - amongst the flowers with long-standing friends. Should you wish to detox from fashion and urban madness. Pettifers Garden is the ideal spot. Wish you all a radiant weekend. There is nothing that can rival an english garden. 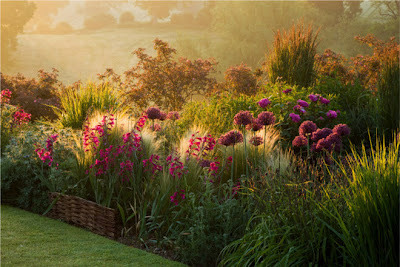 Pettifers Garden is a garden of romance, thoughts and dreams. Have you ever heard of a Botticelli meadow? I think not. Omg I can't believe these are PHOTOS. I thought they were paintings. These are so jaw-droppingly gorgeous. Like, something out of a dream. This may actually be what heaven looks like. These images are beyond orgasmic!! I go to England every year but stay in London. I really need to venture outside. How far is Oxfordshire from London? This is beyond magical. It seems like a mystical world, I have no words!! You are so true. The best gardens!! love the sun mist...so pretty. Wow, these gardens are divine - the colors are so surreal! I know rain is a very high price to pay, but British garden are worth it. Thank you for sharing so much beauty. Wonderful, what a lovely suggestion. England has been on my travel list for so long, it feels almost silly to put another destination to it! But alas, I think I must! 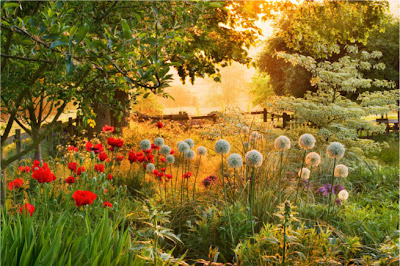 Happy easter gorgeous - these gardens look divine - would love to see them one day! Hope you're doing well my dear! Happy Friday!